As both a family man and business owner, Ronnie Hill has established an excellent reputation for doing business the "right way!" Ronnie is married and has one son. 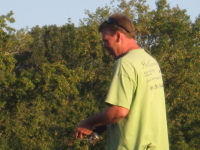 His hobbies include the outdoors, fishing, boating, camping, walking, horses, all sports and spending time with his family. His new interests are golf and learning how to become self sufficient through the use of solar energy. His favorite magazine is Mother Earth News.